In 2012, a start-up company launched testing for an app that would let a person hail a cab on demand from a smartphone. Today, that ride-sharing service, Uber, has 8 million users worldwide, and the number of cars operating in its network surpasses that of taxis in many large cities, including New York. In just a few short years, Uber has disrupted the age-old business model of the taxicab and threatens to make the service obsolete if the latter doesn’t find a way to compete. But beyond its convenience, Uber introduced a new element to a century-old notion of ride-hailing, putting human needs at the very center of its promise of customization on demand. “Uber evolved beyond the technology and actually created a new way for a taxi driver to connect with their consumer,” says Rohit Anand, principal at architecture firm KTGY Architecture + Planning’s Tysons, Va., office. 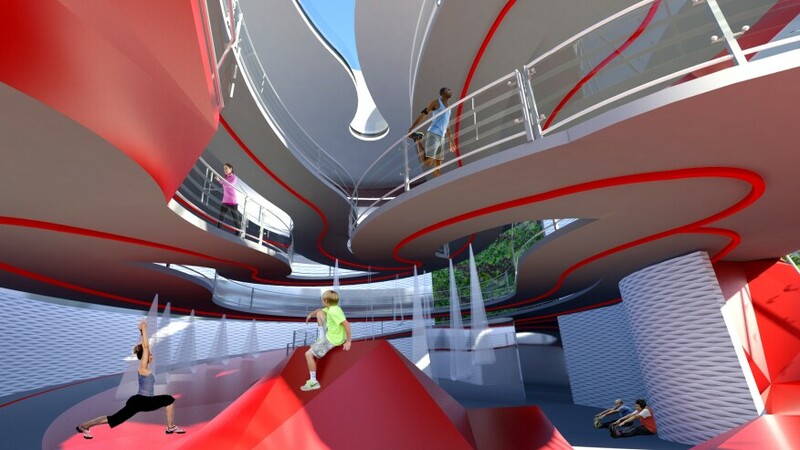 The human-centered business model of disruption set the bar of ambition for KTGY as it took on the task of designing its “Apartment of the Future” concept. In collaboration with the National Multifamily Housing Council (NMHC), the company set out to imagine how multifamily housing will evolve over the next decade, focusing on how developers and designers can create spaces for residents that enhance their living experience in an environment that changes and evolves constantly. But this isn’t your typical next-century Jetsons’ apartment. “We looked at technologies that exist now and extrapolated things about 10 years into the future and considered where they might be,” says Anand. To plausibly project what future multifamily living might be like, the team pegged technology and the Internet of Everything as givens. However, the team didn’t want the concept to focus solely on technologies as we know them today. The team cast a wide net outside the bounds of the multifamily and housing industries for fresh inspiration, exploring what office, retail, and hospitality spaces had done to offer consumers something unique. “We tried to understand how those industries were connecting with their consumers, asking what was successful and what was not,” says Anand. The focus on providing an experience, instead of just a space or commodity, had quickly set those thriving businesses apart. Through its research, the team started to realize two things that would define the project — first, consumers value experiences; and second, humans have basic, primal instincts and needs that will never change, even if technology evolves to serve those needs in new ways. If nothing else, developers should focus on these fundamentals and design spaces that enhance them, the team concluded. “Of course, there are more primal experiences people have, but we think that whichever way technology goes, and no matter what happens in the future, you should be paying attention to serving these basic instincts,” says Anand. With this framework in mind, KTGY set to work to create a concept that would reinvent living spaces to satisfy these needs in a fresh, innovative way. “We wanted to redefine those primal experiences based [on] trends that we’re seeing now and project them into the future,” says Mack. Thus, eat became consume, sleep became refresh, work became create, and play became amuse. Based on these adaptations, the team designed both an amenity space and a unit concept to represent what it thought multifamily could potentially look like in 10 years. The Consume spaces in the Apartment of the Future are dominated by society’s craving for instant gratification and on-demand access to goods and services, such as via Netflix, Uber rides, or online shopping with quick overnight delivery (and, at some point — perhaps soon — instant drone delivery from sites like Amazon). When thinking about on-demand and instant services, the architecture team turned its attention toward a new technology that’s garnering attention today and could likely become a ubiquitous, household technology 10 years from now — 3-D printing. In the unit representation of Consume, KTGY imagined a 3-D printer running along a track on the ceiling that would allow residents to print anything, anywhere within the unit, at any time, at the touch of a button. Given emerging construction technologies, components of the units themselves may be 3-D printable during the build process. In the Consume concept, for example, the dividing wall between one unit and another is designed to fold down on each side and become a shared dining-room table between neighbors, with the hope of going beyond the basic on-demand usefulness a 3-D printer can provide and giving a more meaningful context to the products it’s producing. 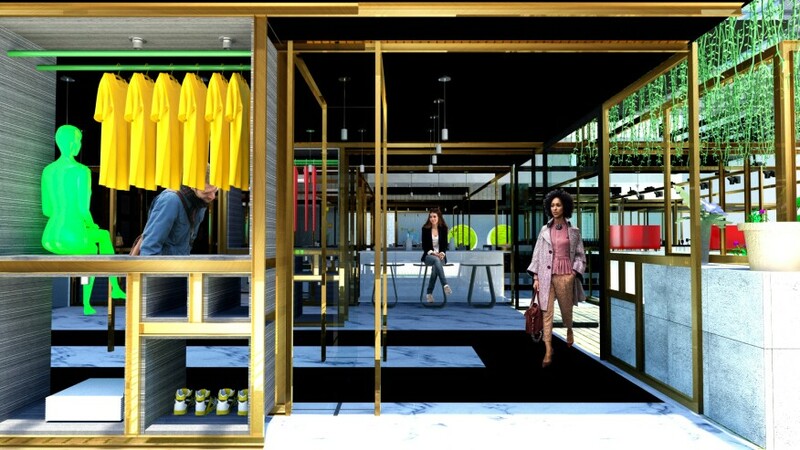 The design of the Consume space also takes cues from retail stores that are currently finding success with pop-up or themed concepts as opposed to the traditional brick-and-mortar model. “Retail is fickle right now, which worries developers of mixed-use properties who think about the possibility of a store going out of business,” says Anand. The pop-up stores have been attracting consumers with temporary, curated products and experiences that keep retail shopping fresh. The team was inspired by one such store in New York City called Story. The revamped “experiential” retail shop picks products, the store design, events, and speakers every few months that revolve around a theme, in order to keep things exciting. One month, the store may be centered around a farm-to-table idea with fresh foods and cooking events or workshops hosted by famous chefs. The next month, it may be redone to focus on beauty, by selling organic skin-care products and holding talks that focus on self-discovery. No matter the theme, Story does more than sell goods — it also seeks to develop an emotional relationship with the customer through different avenues. The retail component of the Apartment of the Future looks something like Story’s model — an adaptable, flexible space that keeps residents engaged and provides the same benefits as the 24/7 online marketplace while connecting residents with each other. The idea translates beyond retail to leasing and dining, as well. A pop-up style retail space offers flexibility and variety. The space would feature pop-up areas that could transform from day to night: A cooktop stove during lunch and dinner could become a fire pit for a late-night social gathering. Tables and stands that showcase goods during the day could be transformed into seating space for a restaurant at night. A long vertical section of the retail space that could be used as a clothing store would be converted into a runway for a fashion show, and so on. The Apartment of the Future’s leasing office would also be housed in this space, where prospective residents would be greeted by “Lisa,” a holographic leasing agent. Lisa would be able to show future tenants virtual diagrams of unit configurations that fit with the shoppers’ lifestyle preferences, for increased customization. When designing the Create common spaces, KTGY looked toward the co-working trend for inspiration. Already, 43% of workers in America do some telecommuting, and there’s been a 50% jump in offline alternative work, according to Gallup’s 2017 State of the American Workplace report. With more Americans working remotely (and unconventional schedules not uncommon) or participating in the gig economy, spaces like WeWork, cove, and NeueHouse have become increasingly popular among teleworkers. Once considered only a futuristic technology, virtual reality (VR) is starting to become a common element of the architectural design process for many firms. KTGY modeled the entire Apartment of the Future concept in VR software that can be experienced through a headset or goggles, immersing viewers in each of the amenity and unit spaces designed for the project. The ability to experience the design as a lifelike space and make changes in real time helped the architects see how different choices looked in the setting in a more realistic way than a flat, 2-D rendering would. VR was a new venture for KTGY, one that Mack describes as a “great new tool that we’ve discovered.” Though that doesn’t mean implementing a new technology didn’t have its hurdles. Beyond offering workspaces, many of these spots host events for their tenants, such as book talks, speaking events, wine tastings, happy hours, and workshops for different avenues of interest. The proposed Create amenity area reflects an evolution of the co-working space, with an energetic, campus-style spirit that facilitates spontaneous collaboration, learning, and the exchange of ideas between residents. The concept’s first-level, public gathering space centers around an amphitheater-like, stepped seating area that looks onto a glass screen that can be converted to a lecture backdrop or dedicated area for educational sessions. As you continue up a ramp that wraps around the space’s many levels, you encounter a semi-public level with open seating designed for interactions that facilitate the new gig economy, such as podcast broadcasting. This section of the area also houses a child-care and play room for residents who need such flexibility. Above these collaborative spaces are levels that feel more like a library, for those looking to work in a quiet and relaxing setting. Residents can use the space’s flexible, customizable office cubes alone or for small meetings. And if they’re looking for a larger meeting area, the cubes can slide along a moving rail to connect and accommodate more people. The KTGY team has also seen technology merging with entertainment as a top trend in today’s culture, shaping the way the designers thought about the Amuse aspect of the project. The Amuse fitness amenity offers residents a variety of ways to keep their exercise routine fresh with technology. For a workout that takes the drudgery out of exercise, residents can climb a dynamic glass wall that creates different routes by lighting up specific hand and foot grips as they progress, or call up a hologram of an Olympic runner or sports star to race against on the multilevel track that winds throughout the gym. If the Apartment of the Future is buzzing with interaction, entertainment, and technology options, residents, of course, will also need a space to relax, unplug, and rejuvenate. Wellness, self-care, and mindfulness have become more important to consumers in today’s busy society, which is saturated with smartphones, social media, and the Internet. NMHC research found that 65% of people say they believe periodic digital detoxes are important for mental health, but only 21% actually take them. The Refresh amenity starts with a green processional path to enhance meditation. So KTGY put a new spin on a serene spa with Refresh, to give renters a space for these much-needed digital detoxes. 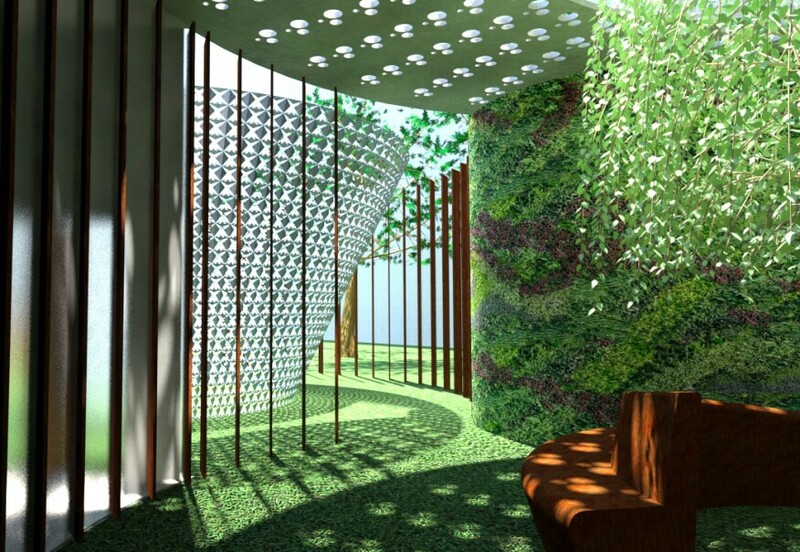 The retreat experience begins as residents walk through an outdoor path that leads to a living green wall, large tree, and pulsing metal art piece that expands and contracts—inspired by a pinecone’s natural ability to do the same based on the atmosphere—to encourage mindful breathing and invoke reflection. From there, residents move to a sauna and steam room meant to detox the body. Stone walls with cascading water surround a shallow pool with sculptural seating. A cleansing shower then transitions the resident into a room with a pool of ice water and warm seating to invigorate the senses. For KTGY, the point was to look at the needs, values, behaviors, and preferences that serve as raw materials for customer demand. This isn’t a story about tangible design alone, however; nor is it a tale about guessing which technological advances will or won’t exist in the future. Rather, its essence is innovation. And in this market, multifamily professionals have two options—innovate or lose touch with what people expect, prefer, and will pay for. Of course, these ideas shouldn’t be taken in isolation, as each property of the future will be different and will have different needs based on its particular renters and what they’re looking for in a home. Developers thus should first consider their market, location, renter demographic, and budget constraints before firming up the design. Written by Lauren Shanesy | April 3rd, 2018 | Copyright © 2018 Hanley Wood Media, Inc. All rights reserved.